Christopher A. Iannotti, MD, PhD, FAANS, of Arizona Neurosurgery & Spine Specialists, located in Phoenix and Peoria, Arizona hails from St. Louis, Missouri, where he earned his MD and PhD with highest honors through St. Louis University School of Medicine. Before that, Dr. Iannotti received his undergraduate degree from Miami University in Oxford, Ohio. Dr Iannotti completed his residency at the Cleveland Clinic, serving as chief resident during his final year. After completing his neurosurgical residency, he also completed a complex spinal surgery fellowship at the Cleveland Clinic, where he trained with world-renowned experts in spine surgery, including Drs. Edward Benzel, Michael Steinmetz and Iain Kalfas. Dr. Iannotti is an assistant professor of neurosurgery at the University of Arizona College of Medicine – Phoenix. Dr. Iannotti’s clinical interests and expertise centers on the surgical treatment of diseases and disorders of the brain and spine. 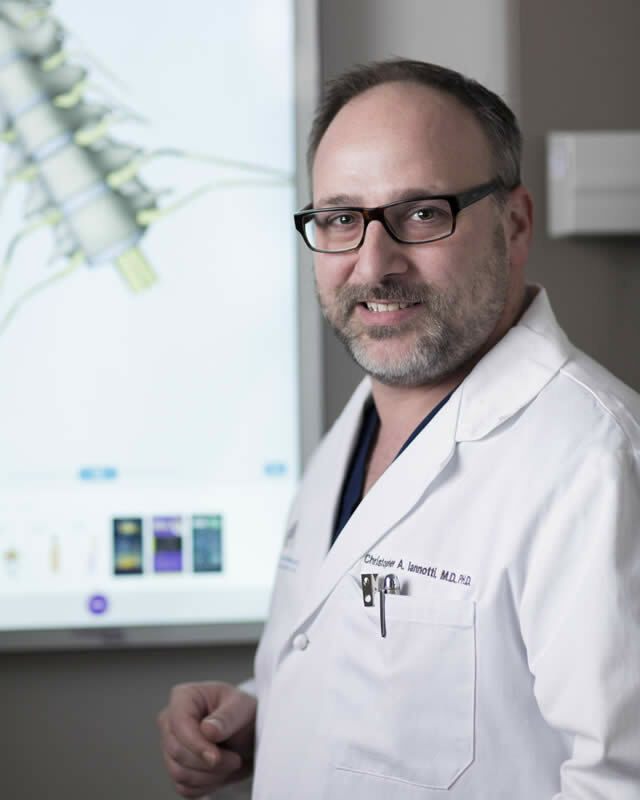 In particular, he has extensive expertise in a comprehensive range of complex spine disorders, utilizing his fellowship training in state-of-the-art complex spine surgery, including image-guided spine surgery. Dr. Iannotti has published numerous studies in leading journals and has written book chapters in neurosurgery and in spinal cord injury. He has performed extensive basic science and translational research in the area of spinal cord injury, having completed his Ph.D. in Neuroscience at St. Louis University School of Medicine and University of Louisville at the Kentucky Spinal Cord Injury Research Center. His research examined the role of cell-based and small molecular growth-promoting strategies to repair the injured spinal cord. During his doctorate studies, he was awarded a research fellowship from the NIH- National Institute of Neurologic Disorders and Stroke (NINDS). During his residency, he received the Congress of Neurological Surgeons Basic Science and Translational Research Fellowship. He has been a past recipient of the Synthes Award for Resident Research in Spinal Cord and Spinal Column Injury. Dr. Iannotti is board certified by the American Board of Neurological Surgery and is licensed by the Arizona Medical Board. He is an active member of the American Association of Neurological Surgeons and the Congress of Neurological Surgeons. "Dr. Iannotti performed (ACDF) Anterior Cervical Discectomy w/ Fusion on my neck last year. I had been suffering for a long time as my entire right side was numb, but burning, and eventually I was dropping things when trying to pick them up. After the procedure I woke up in recovery knowing it was successful and I didn't even have to take a TYLENOL while recuperating!! I highly recommend Dr. Iannotti at AZ Neurosurgeons." "This is one amazing Neurosurgeons! He was very candid with me about the surgery I needed. My spinal surgery of the C4-5 and C5-6 disc took place on 8/1/2018. On 8/2/2018 I was up walking around. Two weeks after surgery I was able to take off my neck brace. What an amazing and caring Doctor! He cares about his patients and I would recommend Dr. Iannotti to anyone needing spinal surgery. Thanks Doc for improving my life!" "Dr. Iannotti is a compassionate, kind, friendly, easy to talk to Dr. He does not operate when it is unnecessary. He explains things well and in terms the average person can understand. I would recommend him again and have in the past. Now my husband is having problems and we are going to him again. You will love him and trust him as we did." "When I went to see Dr. Iannotti I was getting around using a wheel chair and a walker. This was during my initial consultation. I was referred by my physician for having lower back pain and leg weakness. After reviewing my MRI, DR. Iannotti told me of my condition and explained what needed to be done to correct that condition. He gave me options and I elected to have an operation that he preformed several times. This made me feel at ease to have the operation done. Excellent surgeon."